Three great rivers, the mighty Mississippi, the Red River of the North, and the St. Lawrence all begin their long journeys within the state of Minnesota. The source of the Mississippi had been sought for years, and it was finally discovered here at Lake Itasca, where it begins its 2,552-mile path to the sea. If you are ever asked to meet someone at Long Lake, you might want to take a raincheck: Minnesota has at least 91 different lakes named Long Lake! With more than 12,000 lakes within the borders of the state, unique names can be scarce. The lakes of the northern portion of the state have transformed the area into popular summer resorts, attracting thousands of visitors each year with their pristine beauty. The name of this state came from the Minnesota River so named by the Dakota Sioux for the river's "cloudy" or "milky water." The Dakota word "mnishota" means "cloudy" or "milky water." Perhaps the most common nickname for Minnesota, "The North Star State" evolved from the State Motto L'Etoile du Nord or "Star of the North." The State Motto appears on the Great Seal of Minnesota and the State Flag. This nickname reminds one of the many lakes in Minnesota. 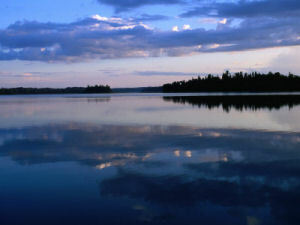 In fact, there are 11,842 lakes that are 10 acres or more. Depending on one's definition of a lake, we have seen numbers as high as 15,000. Minnesota's license plates display the legend "10,000 Lakes." This name came into use at the Pan-American Exposition at Buffalo, New York in 1902. The superior wheat, flour and dairy products of Minnesota caused the state to be referred to as "The Bread and Butter State." According to Minnesota in Three Centuries , 1908, "Minnesota received its most widely know sobriquet, "The Gopher State," from the striped gopher, a common species throughout our prairie region." It seems that there was some discussion in the middle of the 19th century, before Minnesota became a state, about whether to call Minnesota "The Gopher State" or "The Beaver State." Opponents of "The Gopher State" called the striped gopher an insignificant animal with a destructive nature. The striped gopher was too useless and undignified to represent the future great state of Minnesota. Opponents of "The Beaver State" argued that the beaver, while numerous in streams, was not abundant enough to represent to whole of Minnesota. A political cartoon, widely circulated throughout the territory, gave wider exposure to the gopher and "The Beaver State" faded into history. Because of the large number of New England emigrants to the territory, Minnesota was sometimes referred to as the "New England of the West." People who live in Minnesota or who come from Minnesota are called Minnesotans. he second quarter to be released in 2005 commemorates the State of Minnesota, "Land of 10,000 Lakes." On May 11, 1858, Minnesota became the 32nd state admitted into the Union, and as such, it is the 32nd coin to be issued in the United States Mint's popular 50 State Quarters® Program. The design features a tree-lined lake with two people fishing, a loon on the water, and a textured outline of the State surrounding its nickname, "Land of 10,000 Lakes." Upham, Warren Minnesota in Three Centuries, 1665-1908, Centennial Edition . Free Press Printing Company, 1908. Minnesota (From Sea to Shining Sea) , by Judy L. Hasday. 80 pages. Publisher: Children's Press(CT) (March 2003) Reading level: Grades 3-5. 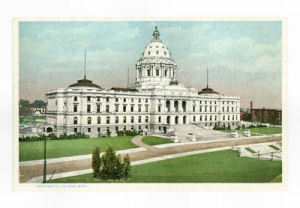 Presents information about Minnesota's people, geography, history, landmarks, natural resources, government, state capitol, towns and cities, and more. Minnesota (World Almanac Library of the States) , by Peter Jaffe and Miriam Pollock. 48 pages. Gareth Stevens Publishing (August 2002) Reading level: Grades 4-6. Filled with the most up-to-date information, including the latest Census results. Full-color photos bring to life the story of Minnesota. In addition to an in-depth factual profile of Minnesota in the form of a state Almanac, this book offers fascinating and lively discussions of the state's history, people, geography, government, economy, culture, and lifestyles. A section on Notable People, a calendar of events, and enough primary source documents, time lines, maps, and other tools to make this unquestionably the best young adult reference material on the USA available anywhere. Minnesota Book of Days: An Almanac of State History , by Tony Greiner. 335 pages. Publisher: Minnesota Historical Society Press; 1 edition (November 1, 2001) This handy guide explores famous and not-so-famous aspects of Minnesota's history in lively day-by-day entries. Whether you are a visitor or a lifelong resident, these titbits about noteworthy events and people just might inspire you to explore Minnesota history in greater detail. Minnesota 150: The People, Places, and Things that Shape Our State , by Kate Roberts. 224 pages. Publisher: Minnesota Historical Society Press; 1 edition (October 15, 2007) The people have spoken. Minnesota wouldn't be Minnesota without Bob Dylan. Or the BWCA. Immigrant farmers. The American Indian Movement. Thousands of citizens nominated their favorite topics for inclusion in Minnesota 150. With short essays, eye-catching illustrations, and text from the winning nominations, Kate Roberts reveals the many ways in which our past becomes our collective history. Read stories from people like former Iron Ranger Brian Weber, who wrote about watching the 1980 Olympic hockey team as a young boy: "It makes me think of our neighbor, a miner with a very Finnish last name, who watched all the games with us. Thinking about it now, after the taconite expansion of the early to mid-1970s, this was the beginning of the end for the mines up there. And I think they knew it. But they felt they had a hockey team and a coach that was fighting for us. And hockey mattered." Learn about the genesis of such iconic businesses as the Greyhound Bus Company, which got its start when Hibbing natives Carl Wickman and Andrew Anderson bought a used Hupmobile, hoping to sell it at a profit. Minnesota: A History , By William E. Lass. 335 pages. Publisher: W W Norton & Co Inc; 2 Sub edition (April 1998) A comprehensive history of a state thought by many to be the most livable. Minnesota evolved from many cultures. By the time the territory was formed in 1849, the first European contacts were nearly two centuries old. When Minnesota was admitted to the union in 1858, only about one-fourth of its area was occupied by white settlers. In this volume, William Lass tells the story of Minnesota from its beginnings to the present with attention to people's adaptation to Minnesota's oftentimes harsh environment. He relates the persistence and change in the traditional frontier businesses in the twentieth century and describes recent developments in Minnesota society, including rapidly increasing metropolitanism, environmental concerns, and the resurgence of conservatism in politics. Minnesota's somewhat unique political history, which featured farm protest movements and the ultimate creation of the Democratic-Farmer-Labor Party, is also discussed. Creating Minnesota: A History from the Inside Out , by Annette Atkins. 336 pages. Publisher: Minnesota Historical Society Press; 1 edition (August 1, 2008) Renowned historian Annette Atkins presents a fresh understanding of how a complex and modern Minnesota came into being in Creating Minnesota . Each chapter of this innovative state history focuses on a telling detail, a revealing incident, or a meaningful issue that illuminates a larger event, social trends, or politics during a period in our past. A Popular History of Minnesota , by Norman K. Risjord. 256 pages. Publisher: Minnesota Historical Society Press (March 15, 2004) What do Paul Bunyan, Charles Lindbergh, and Jesse Ventura have in common--Minnesota, of course! In A Popular History of Minnesota , historian Norman K. Risjord offers a grand tour of the state's remarkable history, taking readers through the centuries and into the lives of those colorful characters who populate Minnesota's past. This highly readable volume details everything from the glacial formation of the land to the arrival of the Dakota and the Ojibwe people, from Minnesota's contributions to the Northern cause during the Civil War to the key players in reform politics who helped sculpt the identity of the state today. A Popular History of Minnesota highlights the historical significance of Minnesota's natural resources--the bountiful north woods, the treasured iron ranges, the impressive Mississippi waterfall on which the Mill City was built. It details the powerful marks left on the state by such luminous figures as Oliver H. Kelley, founder of the national Grange movement, Hubert H. Humphrey, champion of civil rights, and Betty Crocker, aid to homemakers everywhere. Lively sidebars outline noteworthy subjects, from the Kensington runestone to the devastating forest fires of the 1890s and 1910s, from the rise of the Mayo Clinic to the preservation of the Boundary Waters Canoe Area Wilderness. Handy Traveler's Guides highlight historic destinations for readers who enjoy seeing where history happened. Fast-paced and informative, with generous illustrations, A Popular History of Minnesota is a must-read for newcomers and established Minnesotans alike.